A rather belated update of what the Special Operations Executive’s ill-fated SPILLWAY mission was up to 70 years ago, in October 1943. Week two of the SPILLWAY mission saw Brig ‘Trotsky’ Davies begin to take a more realistic view of his position. On Saturday 24 October 1943 he issued orders that all men should have minimum personal kit packed and ready to grab, and one wireless set and operator should always be ready to leave immediately. His intention is that the mission can disappear from its Bizë quarters with one hour’s notice. On Monday 25 Davies hears that Enver Hoxha and the LNC Council are likely to make contact in the near future. 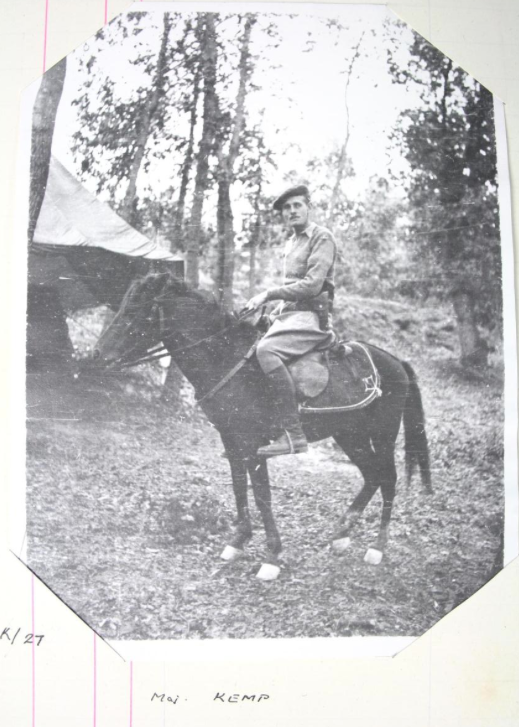 An Italian vet, Lt Tesio, arrives – quite an asset as the mission has accumulated over 100 mules and horses. Two BLOs who had been present in Albania since summertime, Andy Hands and Richard Riddell arrive from Dibra; Hands apparently has an unworkable plan to raise resistance, which Davies refuses to approve. On Tuesday 26 a 50-strong party from the Balli Kombetar, nationalists bitterly opposed to Communism, arrive. The partisan guards bristle, but there’s no shooting. Wednesday sees Davies visit the local partisan camp, where he is much amused by its ragged drill displays. He comments that they appear to believe there are four Allies in the war – Russia, Britain, the US and Albania. Peter Kemp, who has recently spent a few days exploring Tirana (badly) disguised as an Albanian, arrives. On Thursday two of Davies’ most trusted BLOs, Alan Palmer and Victor Smith, leave for the south. When Davies is shot and captured in January, command of the British mission to Albania will fall to Palmer, much to the puzzlement of most of the surviving BLOs, including Reg Hibbert, who thinks Peter Kemp is by far the most able officer in the country and the obvious choice to take over. 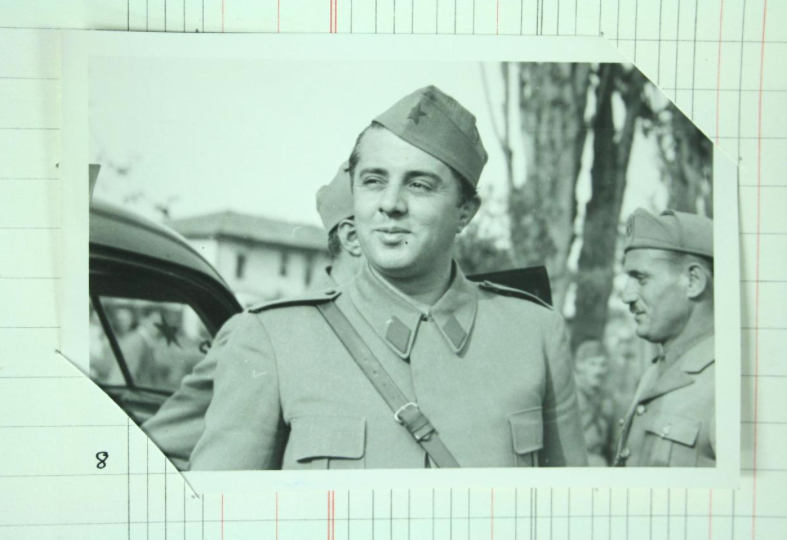 Kadri Hoxha, the local partisan commander arrives for dinner. He brings with him a striking-looking female partisan who speaks good French. 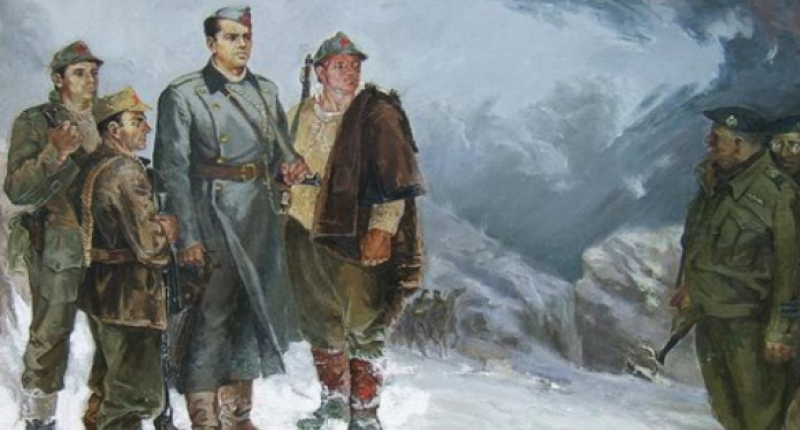 On Friday Kadri Hoxha returns to the partisan base with Lt Frank Trayhorn, who returns later with a long list of complaints about the supplies dropped to the partisans by the RAF. A supply sortie is expected that night but fails to arrive. Saturday sees Captain Alan Hare (future chairman of the Financial Times), heading into the nearby town of Elbasan for a shopping trip. The partisans slip in a long list of ‘luxury’ items. Two members of the Balli Kombetar arrive; they are polite and reasonable in stark contrast to the LNC members Davies has encountered so far. Kadri Hoxha arrives with an invitation to Labinot for the following day – Enver Hoxha is finally ready to meet Davies. One of the things I’ve discovered over the past few weeks is that those Albanians who were lucky enough to be educated under communism are already dimly aware that British Liaison Officers were sent to liaise with Enver Hoxha during the War. In some parts there’s a slight obsession with the thousands of gold sovereigns we Brits supposedly left buried all over the place – I’m sure some folk suspect I’m a gold hunter. Hoxha wrote about the various BLOs parachuted to work with him in his memoir The Anglo-American Threat to Albania, which is available as a free PDF on the interweb, along with most of his other scribblings, at this beautifully designed communist website. It’s actually very readable, though probably not as reliable a historical document as, say, The Bible. Trouble is, a lot of his anti-British slurs have stuck. 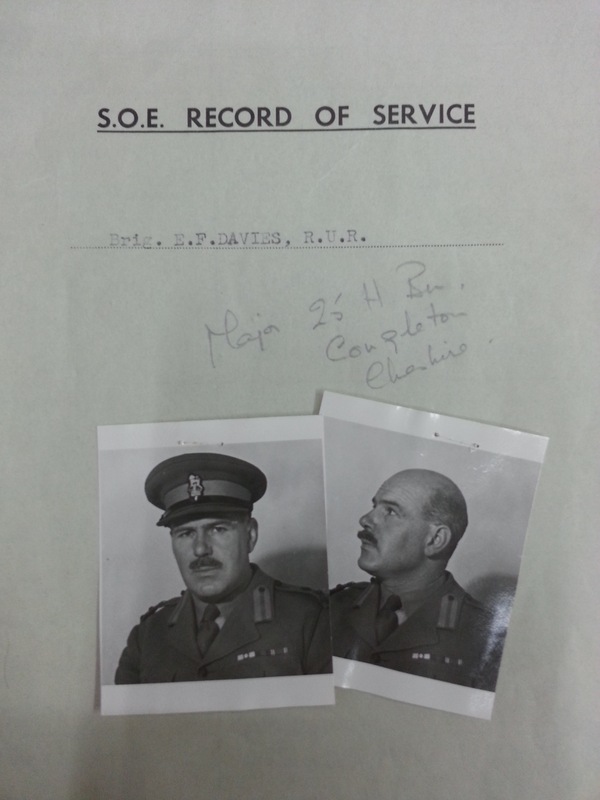 Particularly one particularly nasty lie about Brigadier ‘Trotksy’ Davies, who led the SPILLWAY mission of 1943/44 that excites me so much and has inspired September’s Endurance Vile Trail with Dr Roderick Bailey. Only a couple of nights ago, as I was slurping the excellent Albanian wine at one of my regular haunts, Juvenilja, the loquacious maître d spoke of Davies ‘surrendering’ to the Germans. I protested, pointing out that Davies had been shot twice in the stomach and once in the heel, was unable to walk and on the verge of death (he drifted in and out of consciousness for a month under surpassingly compassionate German care in Tirana). It cut no ice with the maître d, sadly. The image of Davies as an ineffectual coward was too deeply ingrained. «Very good, sir, goodbye!» replied the Colonel. A number of Ballists and Germans were killed and the firing stopped. The enemy withdrew. After the battle, the partisans discovered that the British General was missing. Exhausted, completely discouraged, he had thrown away his weapons and surrendered without firing a shot. The report about the event reached me at Shmil, when we had made all the preparations for our journey and were almost ready to start for the Korça zone. The General who had advised us to surrender had long been planning to surrender himself. Thus, he found the moment and made his plan a reality. 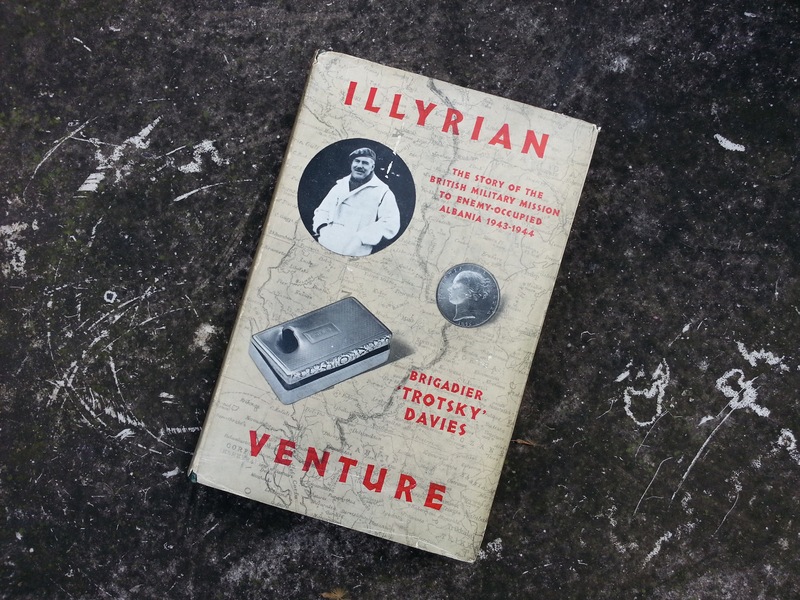 Hoxha wrote this in the 1970s, 20 years after Davies published his own memoir, Illyrian Venture, which Hoxha surely had translated into Albanian for his own private consumption. Perhaps Davies’ interpreter (and Hoxha’s spy) Fred Nosi read it to him as a bedtime story. Bullets were still cracking around continuously… I shouted to Nicholls, ‘Go on, I’m hit – you take charge.’ He looked down at us in horror; the one thing he had not wanted to happen had happened. He was ill, weak, and in no state to march, still less to take on the responsibility of the Mission at a time of disaster like this. He just said, ‘Very good, sir, goodbye,’ and went on climbing painfully. Davies and the other wounded were dragged through the snow to a nearby sheepfold by his bodyguard, Sgt Jim Smith, who held the Ballists off till his revolver was empty, then used his fists till he was overwhelmed. I won’t go into too much detail about this as Smith is a real hero, and will get a post of his own in the next couple of weeks. Hoxha was mistaken about a number of Germans being killed. No Germans were killed for the simple reason that no Germans were present. Davies was captured by Albanians led by the local Ballist commander Azis Biçaku, and handed over to the Germans four days later after being carried out of the mountains on a stretcher. Palmer [Lt Col Alan Palmer, who worked with Hoxha in 1944 and gave strong support to the LNC] was quite definite that there was no knowledge of the future disaster and that Enver was genuinely upset at the turn that events took. Finally, I should point out that Hoxha’s suggestion that Lt Frank Trayhorn betrayed Davies is simply not credible. Trayhorn had been separated from Davies and Nicholls from about 18/19 December, so 20 days earlier, and his last information would have been that they were heading east to break out of the German encirclement. Trayhorn probably wouldn’t have known where Davies was even had he had wished to betray him. There is no evidence that Trayhorn experienced any rough treatment at German hands after his capture, too, so for Hoxha’s accusation to hold any water Trayhorn would have had to voluntarily share information that he almost certainly didn’t have.